With years of experience and a reputation for excellence, Flavours Catering + Events are funeral catering specialists. We understand the sensitive nature of bereavements and endeavour to provide funeral catering with a compassionate and caring approach. Funerals, wakes and memorials are a time to reflect on and celebrate the lives of our loved ones and to help us remember their very unique story. Our bereavement catering service provides comforting refreshments and warm hospitality for post-funeral functions. Alternatively, if you'd like your funeral catering to be more personalised, our team will work with you to create a custom menu. We can tailor your funeral catering to suit your budget, venue or special dietary requirements. We'll take time to discuss your specific needs then we'll prepare a variety of different menus for your choosing, providing guidance and advice where necessary. We can provide funeral catering anywhere you please - including church halls, estate function rooms, community halls and private homes. We would be happy to liaise with your funeral directors to help make the day go as smoothly as possible. Our bereavement catering service also extends to staff hire. We understand the importance of staffing your event with respectful and discreet personnel. Dressed in full uniform and impeccably groomed, our staff will oversee the function and will provide an all-inclusive service including: set up; preparation of food; greeting guests upon arrival; service of food; pack down; and thorough clean-up. We also offer equipment hire, such as chairs, tables, linen and so on, should you require it. Our funeral catering is flexible in terms of whether you'd like a fully staffed event complete with an onsite team of wait staff &/or beverage staff, or you might prefer us to simply deliver the food ready-to-serve, allowing your guests to help themselves. 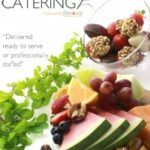 Flavours Catering + Events will listen to what you'd like for the bereavement catering and will ensure everything takes place exactly as you wish – no detail will be spared or overlooked. We provide peace-of-mind and compassion at the time you need it most. Call our friendly team today on 1300 368 605 to discuss your requirements or to ask for a funeral catering quotation.